One of New York City’s oldest neighborhoods is a historic area known as the South Street Seaport, and culture is being cultivated there. Located in the borough of Manhattan, the South Street Seaport is distinctive from the neighboring Financial District, boasting some of the oldest architecture in the city, and the largest concentration of restored early 19th-century buildings in all of New York. It’s here you can find renovated commercial buildings, restored early fishing ships and fish markets, the latter of which dominated the now historic area for much of the 19th century and beyond. 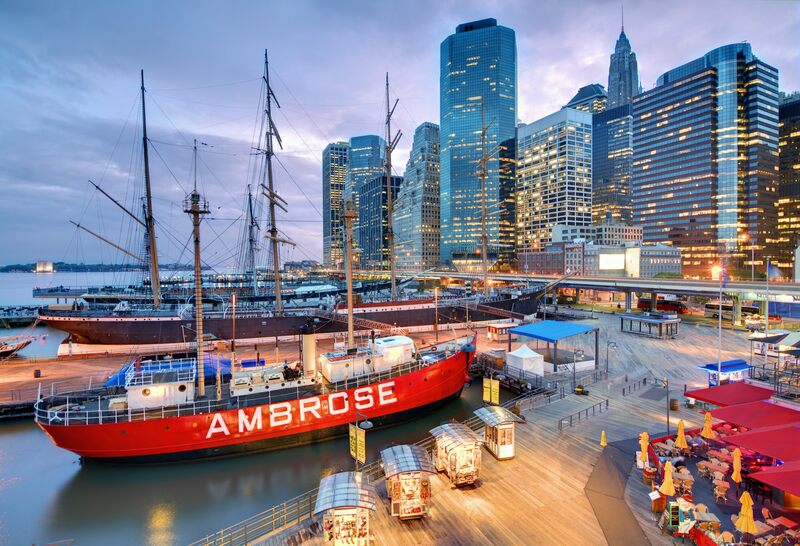 The South Street Seaport is a cultural hub because of the area’s dedication to retaining its historical artifacts like buildings and ships, maintaining a seaport essence while encouraging contemporary cultural events and growth. This historical area is a shining example of a beautiful marriage of the historically precious old, and the culturally vibrant new, merging its cobblestone streets and preserved architecture with a thrilling nightlife, restaurants, entertainment, and merchants. The South Street Seaport is as alive now as it was in the 1800s, albeit with a more touristy edge. Pier 17 at the Seaport is the heart of the historical area, the meeting place of the old and the new, with much to offer both visitors, and New Yorkers who consider the neighborhood to be a home away from home. Since Hurricane Sandy devastated many New England ports and waterfront areas, New York’s famous South Street Seaport has teamed up with Faneuil Hall in Boston and Union Station in Washington, D.C. in an effort to preserve their identities as thriving cultural hubs. Since then, there has been a push for the preservation of a culturally rich distinctiveness in these places, and now at Pier 17 you can find more entertainment, dining, and diversity than ever before. On any given day as you wander down the bustling Pier, you’ll come across dozens of merchants, a huge selection of find dining and street food, live performances, film viewings, and historical tours. The Seaport’s preservation team describes how “The South Street Seaport’s low-scale buildings have a legacy of combined retail and tourism. A sense of the district’s gritty and boisterous past as New York City’s wholesale fish market also lingers in some of the area’s oldest commercial buildings. These brick and stone structures also have historic ties to the East River, the Brooklyn Bridge, and the piers,” setting a wonderful old-feeling backdrop against a contemporary cultural hub. During the summer, the South Street Seaport boasts numerous events, including free yoga classes, weekly live music performances, film screenings, pop-up vendors and retailers, as well as ongoing cultural events. Pier 17, despite how its offerings attract thousands of people from around the world each day, is still a favorite place of many New Yorkers to frequent because there is something there for everyone. If it’s history you love, or art, music, food, or shopping, the South Street Seaport is happy to provide it, maintaining a spirit that has endured hundreds of years.